The Gulf of Chiriquí in Panama is unique in many ways. As one of the few locations in the world where both northern and southern hemisphere Humpback Whales migrate, the amount of whale activity in the region is astounding. They travel to Panama in search of warm breeding waters so their calves can survive. 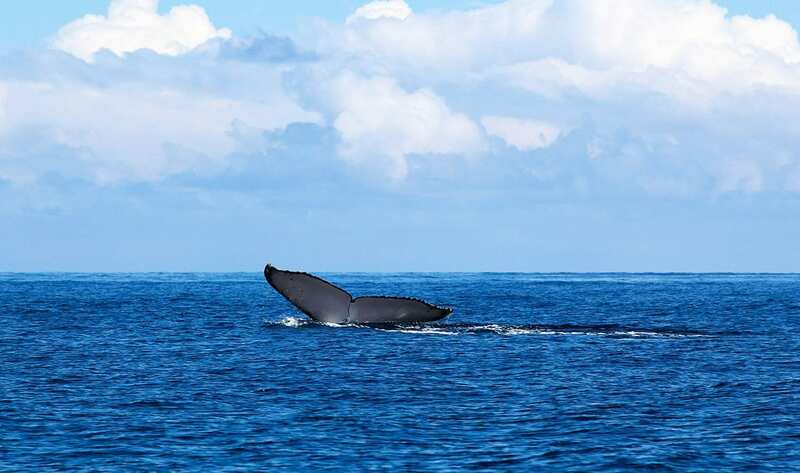 The gulf is also protected by Coiba Island’s marine protection area, so the whales have come to learn that it’s a safe area to birth and raise their young. This not only makes for the best whale watching in Panama, it also makes for one of the top locations for whale watching on the Pacific Coast of both North and South America. Watch these almighty hulks breach from the water as they teach their calves to swim before continuing with their migration. Whales aren’t the only thing we spot—pods of friendly and inquisitive dolphins will occasionally come frolic and play near the boat. Here’s your chance to get up close to the majestic giants of the sea! Cala Mia Offers a 95% success rate to see a whale between July 15 -October 1. If you’re looking for Pacific coast whale watching, Cala Mia’s location ranks with the best of them. Make sure you have your camera ready to capture this amazing experience. The show is spectacular, and you can reasonably expect to see a lot of surface activity. Watch as they push and shove one another, jump and flap their tails, and breach with their family and young ones. Cala Mia runs daily tours to see these precious species which includes a beach stop over and refreshments. For an unforgettable journey and the best whale watching in Panama, come to Cala Mia Island Resort.